The DryLam SL27, 27" School Laminator is an easy-to-use and reliable School Laminator . With basic on/off switches for the motor and the heater, virtually any user can quickly and easily laminate prints with the the SL 27. The ease of use of the DryLam SL27 make it an ideal choice for a school or church environment with multiple users with basic lamination needs. Use the SL27 to protect and enhance prints and posters for years of use. Laminates up to 27" wide. 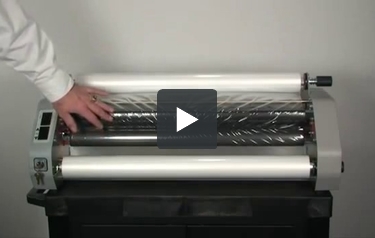 Depth (with feed tray) 20"
We’d like to welcome everybody to our video on the SL27 School Laminator. We’re going to show you how to properly load laminating film and thread it through the machine, and also talk about the basic operation, the controls and the features of the machine that are available on the SL27. You’ll notice that there are two mandrels on the machine – a top and a bottom mandrel. They are color-coded and matched for proper position, red on the top, blue on the bottom. To load laminating film on to the mandrel, you remove it from the machine and you insert the mandrel into the laminating film so that the dull adhesive side of the laminating film will unroll and be away from the heat source. The shiny side of the laminating film will go up against the heat shield. The mandrel is inserted into the roll of film to the core clip and then rotate counter-clockwise on the top until there are equal portions of the mandrel protruding out the left and right sides that can be mounted into the laminator itself. And that’s our top roll. The bottom roll is done very similarly. Again, we’re looking at a dull adhesive side of the laminating film that will be away from the heat shield, the shiny side of the laminating film against the heat shield, the film unwinding off of the bottom of the roll. You take our mandrel, insert it and then rotate in a clockwise direction for the bottom to where there are equal portions of the mandrel protruding from both the left and right sides, and then mount it into the machine. For continued threading, the bottom roll of film has an idler bar which you thread the film underneath and pull until even. Then we can gently back the film onto the roll. And then to thread the machine, we are going to slightly overlap the films like so, take our threading card, insert it into the nip opening of the laminator and then advance the film through. The threading card will continue to come through the laminator. We’ll run this until the laminating film clarifies and all of the wrinkles have disappeared. And then we can stop the advancement of the film web, take our cutting knife and cut it loose. As the laminator heats up, the heat is transferred through the laminating film and the dull adhesive side begins to clarify, which you can see on the heat shields. When at proper operating temperature, we’ll make some additional adjustments here but first we’ll feed some of the laminating film through. Then we’ll watch for the film to start to clarify and even out across the shield. Any wrinkling that might occur can be adjusted by using the brake tension controls located on the bottom mandrel and the top mandrel. Rotating those clockwise will slightly increase unwind tension and that can help smooth the laminating film on the surface of the heat shield. What we’re looking for is the film to be clear and smooth, free of wrinkles on the heat shield. As the film exits the back of the laminator, it should be clean, clear and free of wrinkles. The threading of the laminator is now complete. We can place our feed tray into position and we’re ready to laminate. I want to talk about the controls on the laminator. There is a heat switch that when turned on will glow red and let you know that the machine is providing heat to the heat shields. There’s a control for the advancement of the film web through the laminator, a forward position, a neutral position, stop and a reverse that will reverse the direction of the laminating film in case you have a jam, but will only operate if you hold the switch in position. It is a momentary switch and will only operate while holding it down.The SL27 Laminator has a key switch with a lock and an unlock position. In the lock position, the laminator will still heat. However, it is not possible to advance the web through the laminator, either forward or in reverse, in the lock position. Rotating to the unlock position will allow you to advance the film through the laminator or reverse the film in case of a jam. On the left side of the laminator is a temperature indicator thermometer that will tell you where you are operating at temperature-wise. Typically, a school grade laminating film will run between 275 and 300 degrees. There is also an adjustment knob for either raising or lowering the temperature. On the right side of the laminator are brake control switches or brake control knobs to adjust the unwind tension to allow your film to run through the laminator wrinkle-free. Simply to increase tension, you rotate in a clockwise fashion. To decrease tension, you rotate in a counter-clockwise fashion. The same for the bottom – clockwise for increase tension, counter-clockwise for decrease tension. Also, you can adjust the curl in your laminating film. If you’re getting an upward curl or a downward curl, you can counteract that by adjusting the appropriate tension control knobs to either increase tension or decrease tension to create a flat sheet. A laminator is a handy machine to have in a school for preserving kids' artwork, protecting signs, and designing posters. But with today's school budgets being so tight, it's even more important to ensure that money isn't being wasted on unnecessary equipment. To answer schools' dilemma, DryLam came up with the School-Lam 27" School Laminator. This machine offers only the basic features needed in a school environment while being budget friendly. Here's a closer look at the strengths and weaknesses of the DryLam School Laminator. The designers made this machine extremely easy to use even for the most inexperienced users. There are only two switches to operate: on/off and forward/reverse. The on/off switch applies to the motor and the heater. Forward is self-explanatory. The reverse functions aids in the correction of a misfeed. Since this machine is made to be used around children, it's built to be safe. A locking key switch helps to prevent use by unauthorized personnel. And an incorporated safety shield protects small fingers that may be tempted to mess with the device while in use. This machine accommodates films up to 27 inches wide. This is perfect for artwork, signage, reusable charts, and any other items teachers may need. Everything is processed at a fixed rate of five feet per minute. There is an adjustable feed guide to help things stay aligned when entering the machine. An adjustable temperature control allows you to choose the optimum temperature for your items. This device is specifically designed to work with School Grade Laminating Films either 1.5mil or 3 mil. This size is excellent for getting the protection you need without spending too much on laminating films. A hand held slitter conveniently stores on the machine for accessibility. DryLam backs this machine with a one year warranty. This machine weighs about 73 pounds. While this isn't overly heavy, it will be bulky to move around. If you're seriously considering this specific machine, we suggest going with the Complete School Kit, which contains this machine and everything you need to get started, including a cabinet mounted on casters for easy mobility. The speed is fixed at five feet per minute. This is a decent pace and won't be much of a problem for most school items. However, if your office is looking for a faster device or one offering more control over the speed, we suggest the Royal Sovereign RSL-2701. Cold lamination isn't offered on this device. Most school items will be fine with hot lamination and this won't be a problem. Just make sure you don't use it with any heat sensitive items, such as photographs or color copies. As you can see, the DryLam School-Lam is perfectly suited for use in a school or church setting. It offers basic functions at an affordable price for a convenient and efficient laminator. With a locking key switch and a safety guard, it's safe to use around curious children. And non-tech savvy teachers will appreciate the simple operation. We think this is an excellent choice for a school laminator. I see this machine comes with a security key, is this a reliable feature? Thank you for your question. The key is an excellent feature for an unsupervised laminator. This secures the machine and allows monitored usage.